Chocolate chips are a staple in almost every Western pantry. Whether you’re baking cookies every weekend for soccer practice or bake sale, adding a decadent topping to porridge or pancakes, decorating cupcakes or simply grabbing a handful for a sweet pick-me-up mid-afternoon, the irresistible bits of semisweet goodness make any day better. While some bakers shy away from using chocolate chips in anything but the quintessential cookie – reasons usually tying into the stabilizer content of chocolate drops preventing them from melting properly – high quality chocolate chips are versatile and more convenient than chopping up a solid block. This versatility sparked Julie Hasson to write 125 Best Chocolate Chip Recipes, filled with everything you could dream of enhancing with a bite of cacao richness. 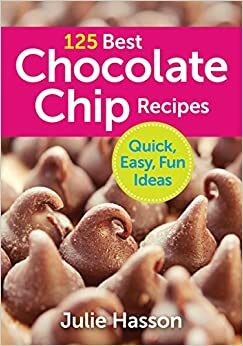 Best Chocolate Chip Recipes is subtitled “Quick, Easy, Fun Ideas”, and Hasson does everything possible to fulfill that statement. The book begins with a thorough documentation of Tools & Equipment (p. 8), Common Ingredients (p. 12) and Tips for Better Results (p. 18), which is worth a perusal even for the most seasoned home bakers. Each chapter has a title page which lists each recipe within that category, including page numbers, and the Index is cross referenced as well, making the search for your next treat truly as simple as opening a bag of chocolate chips! The hardest part about using this book will be deciding what to make first – Hasson includes an array of items, such as cakes, cookies, muffins and puddings (all more or less “common” chocolate-chipped fare), but also finds innovative ways to incorporate the morsels into drinks (Strawberry Chip “Moothie” (p. 28) anyone? ), spreads (Warm Raspberry Chocolate Chip Spread (p.44), please!) and even a Chocolate Tiramisu (p. 163)! I personally opted for a few more “traditional” recipes to break in this book and test it’s mettle. I wanted to appreciate the taste of the higher-cocoa percentage morsels I usually buy as they were, without melting and/or reforming them into purees, cocktails or flavoured candy. I was still trying to power through shredded zucchini left over from last year’s garden harvest, so Hasson’s Double Chocolate Zucchini Cake (p. 65) was an obvious first choice. 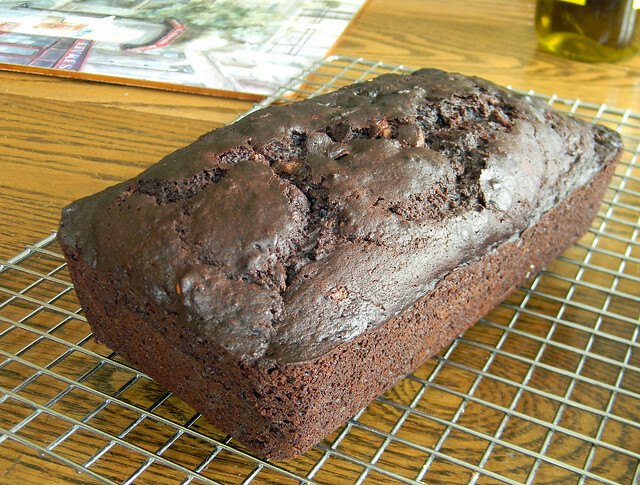 I was able to reduce the oil (replacing half the volume with prune puree) and sugar (replacing one of the cups with ½ cup of a stevia baking blend) and still be rewarded with two loaves of moist, rich and perfectly chocolate-studded decadence. I’m sure the loaves would freeze well too for last-minute snacking – but ours never got that far! 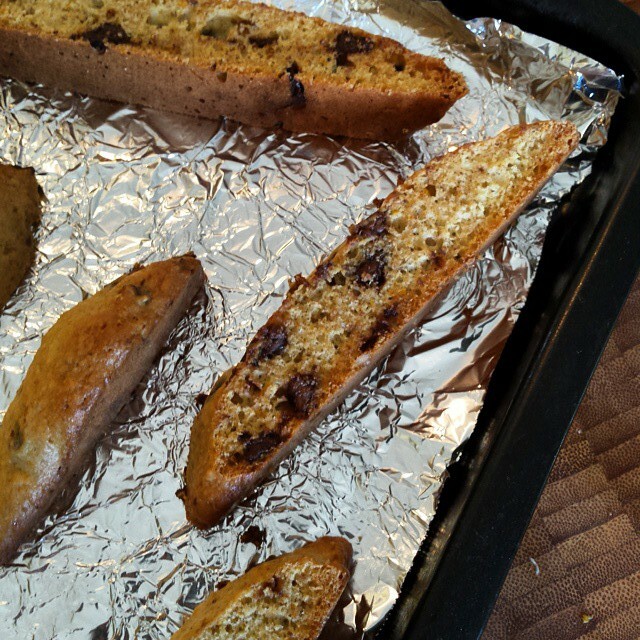 For a little “lighter” take on a chocolate chip cookie, I chose Hasson’s Chocolate Chip Orange Biscotti (p. 94), which plays the richness of semisweet chocolate against the fresh, fruity notes of orange zest and extract. With the biscotti, I found that I needed to use the juice of the orange as well as the zest for the proper consistency, but that modification rewarded me with even more flavourful, crunchy treats for the staff room. This recipe even lent itself well to whole grain baking, spelt flour adding a slight nuttiness that almonds would in the traditional Italian cookie. I still have a host of “chipped” treats on my list to make – as long as the waistlines of my family agree! While they may not hold the elite status of couverture or single-origin chocolate bars, chocolate chips are undeniably a pantry workhorse. From the classic cookie to the craveable cocktail, something from Julie Hasson’s 125 Best Chocolate Chip Recipes is sure to provide a semisweet moment of bliss to your day. If you think that you need to be in the writing business, then you need to work on Edubirdy review as soon as possible. I am in the writing business at a good wage right now, and my way in was that review, as well.